How many times have you arrived at or exited a grocery store only to realize that you forgot many of the items you needed? 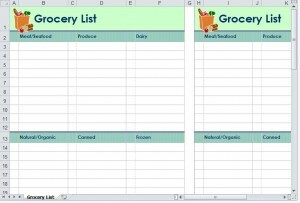 A personalized grocery shopping list template, like the free, easy-to-use, downloadable Excel Grocery List template on the Microsoft Office website, can save you time and money on your next shopping trip. Highlight and delete pre-entered text you don’t need from the grocery shopping list template and then start entering the items you will need to buy on your next grocery run. For example, enter a food item in the first empty cell in the Items column. Enter a category, such as “Produce,” in the cell next to the item in the Category column. Add any details in the Brand/Comments column that will help you locate the item when shopping. Consider color-coding the items on the grocery list template to help you differentiate them by department. For example, you might assign the color “green” to the Produce department. To highlight a field in Excel and change it to that color, right-click the item cell, select “Format Cells…,” click the “Fill” tab, select a color and then click the “OK” button.